Close your eyes and touch your nose. If everything is working properly, this should be easy because your brain can sense your body, as well as its position and movement through space. This is called proprioception. But how does this "sixth sense" work — and what happens when it clashes with other senses? 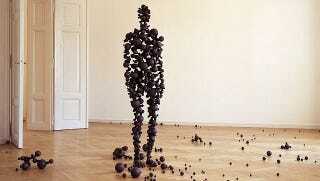 Top image: Sculpture by Antony Gormley. We're all familiar with the five standard senses, which include vision, hearing, smell, taste and touch. The idea that there are only five of them has been rooted in our minds since the time of Aristotle, who explicitly rejected the idea of a sixth sense. But for centuries scientists have seriously entertained the idea of a sixth sense that allows us to perceive our bodies. There remains a lot of debate about whether this sense, which later became known as proprioception, can be considered an additional sense alongside the five standard ones. After all, the five senses all allow us to experience the outside world, whereas proprioception allows us to understand our physical place within that world. Sixth sense or not, proprioception is recognized as being vital to our daily experiences and something that contributes to our overall body ownership. As Nature's Allison Abbot says: "Without it, our brains are lost." Scientists say they&apos;ve found the neural origin of humans&apos; "sixth sense"
Let's start with what proprioception is not. Proprioception is not the vestibular system — the master controller of our balance and spatial orientation. However, the vestibular system does contribute to the guidance of our bodily movements. And though the two terms are often used interchangeably, proprioception is not kinesthesia. Like proprioception, kinesthesia involves the senses of limb position and movement, but scientists typically view the focus of these two as being quite different. That is, kinesthesia is behavioral in nature, and it places an emphasis on the body's motions, as well as incorporates routine or habitual behaviors to improve movements. Both hand-eye coordination and muscle memory involve kinesthesia — the more you perform certain actions, such as during sports, the better at them you will become. Comparatively, proprioception has more to do with body position, and focuses on the cognitive awareness of the body in space. Importantly, the proprioceptive system is often considered to include both the vestibular and kinesthetic systems. According to a 2012 review on the topic, proprioception includes "the senses of position and movement of our limbs and trunk, the sense of effort, the sense of force, and the sense of heaviness." Proprioception uses receptors located in the skin, muscles and joints to build the internal sense of our bodies. Surprisingly, the study of proprioception began hundreds of years ago. In 1826, neurologist Charles Bell questioned what functions the muscles had, other than to contract under the command of motor nerves. He concluded that they must provide our brains with the position of the body and limbs when the brain has no other way of knowing these things (such as if you can't see your limbs). In 1887, neurologist Henry Charlton Bastian proposed "kinesthesis" to replace the common terms "muscular sense" and "sense of force." To Bastian, kinesthesia, then, was the perception of the position and movements of the limbs, as well as their degrees of resistance and weight. Almost 20 years later, in 1906, neurophysiologist Charles Scott Sherrington coined the terms proprioception, interoception and exteroception. Proprioception, he said, was an awareness of the body, which stems from sensory receptors — proprioceptors — in the muscles, tendons and joints. Interoceptors and exteroceptors provide the brain with information about the internal organs and external world, respectively. Originally experts believed we figured out the positions of our limbs from our muscles. But in the 20th century they ascribed this to joints instead, based primarily on studies on the stretch receptors in the knee joints of cats. Today the view has flipped again, with most physiologists believing that the principle proprioceptors are housed in the muscles. For the most part, proprioception works because of muscle spindles (below), a kind of sensory receptor within muscles. Research in the 1960s and 1970s found that muscle spindles detect the changes in length and velocity of a muscle, and then transmit that information to the central nervous system via sensory neurons. The changes detected by the muscle spindles also signal the angle of related joints, though joints have receptors that may contribute some information about limb positions. Additionally, the skin has stretch receptors, or mechanoreceptors, that can detect small movements of the limbs. These proprioceptors, of course, can also work in the absence of movement — this is how we instinctively know where our hand is, even when it's still. But there are other proprioceptive sensations that are always associated with movement, which are known as the senses of effort, force and heaviness. Within the tendons that attach muscles to bones are proprioceptors called Golgi tendon organs, which provide the brain with information about muscle tension. This is your sense of how much force you're exerting. Relatedly, the sense of effort refers to how much effort is required to produce a given motion, and this sense can be thrown off by fatigue from, say, exercise. Tendon organs and muscle spindles also convey to the brain the sense of heaviness, which relates specifically to those occasions when you pick up and move objects. The brain — particularly the cerebellum — takes information from all of these proprioceptive inputs to try to determine the location and movement of body parts. But the way we sense our body and its motion generally involves more than just proprioception. For instance, a 2010 study noted that there are no sensory signals that inform the brain about the size and shape of body parts. The researchers concluded that our sense of position must refer to a "stored body model," which we may unconsciously develop through our interactions with the environment. Scientists have also known for many years that our vision strongly affects our sense of body in space. In 1999, researchers found that visual cues and proprioceptive cues about the position of the arm are encoded on to the same neurons in the premotor cortex of monkeys. Research also suggests that our vision is involved with charting out the path and kinematics of our reaching movements, while proprioception turns this plan into action. One study even suggests that vision sometimes trumps proprioception when it comes to determining the positions and movements of body parts. Importantly, proprioception and our ability to detect the movement and location of our body parts contribute strongly to our sense of body ownership, or the knowledge that our body belongs to us and not someone else. Recently, scientists discovered that the brain doesn't require visual input for body ownership — only proprioception is necessary (though vision helps). And a few studies have showed that proprioception and multisensory integration are important for the development of body awareness during infancy. Body perception may even be present in newborns. But what does this mean for people whose proprioception isn't working because of spinal cord injury or other issues? Is their sense of their bodies different? According to some research, the lack of these inputs results in a "disturbed sense of an embodied self." Though proprioception is vital to sensing our bodies and developing a sense of ownership of your body, it's not infallible. This is especially clear when you consider just how easy it is to get your sense of your own body to contradict with what your see with your eyes. The most well known example of this is the "rubber hand illusion." This illusion basically boils down to convincing someone that a rubber hand is part of their body by gently stroking the rubber hand and the person's (hidden) hand at the same time. This causes the person's brain to shift its sense of hand position from the real hand to the rubber hand, a phenomena that's called proprioceptive drift. Research has shown that this proprioceptive drift can also occur using virtual reality. Taken together, these results indicate that ownership of the supernumerary hand depends on achieving a match between the visual information about the spatial orientation of the rubber hand and proprioceptive information about the orientation of the real hand, and on a match between the correlated visual and tactile information from the two hands. Misguided proprioception may also be behind phantom limb phenomena — an amputee's sensation that their missing limb is still there. A few years ago, scientists proposed that phantom limb pain is the result of "proprioceptive memory," a kind of conflict between vision and memory. The brain remembers the positions of the limb and its relation to the body and other limbs (based on proprioception), but the eyes don't see the limb. The researchers argue that proprioceptive memory may be why so-called mirror treatment — which involves viewing the reflection of the intact limb superimposed over the missing limb — works to relieve phantom limb pain. The treatment, in a way, resolves the conflict between the visual and memory systems. It's still unclear, however, just how the brain builds and maintains its internal representations of body form. It's also curious as to why, if we can form a sense of body ownership based on proprioception alone, it's seemingly so easy to mess with this perception using other senses (vision and touch). Future research will, no doubt, solve these mysteries, as well as many others, including how proprioception changes with age — it is thought, for example, that declining proprioception is partly responsible for the elderly's increased tendency to fall. Inset images via Tsutomu Takasu/Flickr and A. Pedro Marinho/Wikimedia Commons.